Although they’ve been serving food for a few days now, tomorrow marks the soft opening for Fleur by Hubert Keller. 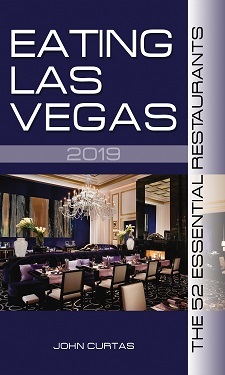 Along with La Cave (only ten days old), and the unveiling of some little b&b next door to CityCenter ( whose name escapes ELV right now), this event marks quite a month in Vegas’ recent culinary fortunes. It may be the catalyst of great things to come, especially if that hotel-named-after-a-magazine draws the world to it doors with its edgy ad campaign and murderer’s row of restaurants. But that will be then and this is now, and right now the small plates bonanza at Fleur is something to behold. Pork meatballs that could teach Italians a thing or two, foie gras parfait with huckleberry compote, pristine oysters, delicate, crispy tuna “taco” and smoky pork ribs were our introduction to what Hubert Keller and Chef Steven Wolf are doing here, but from the taste of things, this will be casual, small plates food on a different level. We asked Hubert if the new, casual format meant less kitchen staff, and he told us it actually means more. Almost double the number of cooks and kitchen hands to keep all those small plates cooked, plated and served. From the looks of the menu (still a work in progress) , there’s going to be a lot of interactive noshing going on. Nitro-frozen cocktails whipped up tableside, smoked ribs served under a dome, etc. — will keep everyone active and entertained, and right off the bat, Fleur promises to be mobbed precisely because of what it isn’t: a big deal meal restaurant. As for the beautiful setting and decor — yes it’s been compromised somewhat. The wall of roses has been replaced with wine corks, and those cozy little alcoves now sport high tops and communal dining nooks. We’re not super-keen on the patio furniture out front either, but the quality of the eats will be enough to keep anyone distracted from these small affronts. From the tastes we’ve had, this place promises to become a small plates mecca, and you’ll be too busy enjoying yourself to notice. Hubert picked up the tab and we left a forty dollar tip. I was skeptical about the restaurant concept. The initial posting of the decor seemed very lacking and I feared the thought of another tapas restaurant. But from what is shown here, I am very optimistic. The nitro-frozen plates are somewhat similar to Alinea in Chicago, and there seems to be some molecular gastronomy occuring here, rather than simple tapas. While I’m still saddened to see Fleur de Lys gone, it seems like the new Fleur may be somewhere worth trying. I’m certainly not anti-tapas, so I have no problem making a meal out of 3 or 4 small plates. You must try Nampol’s Chicken Wings. Mmmmmmm…..